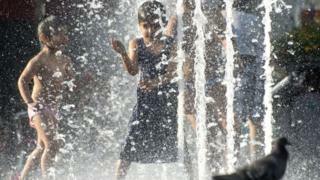 The past 30 years in Europe have likely been the warmest in more than two millennia, according to new research. The study used tree ring records and historical documents to reconstruct yearly temperatures going back 2,100 years. Scientists say that past natural variability in temperatures was greater than previously thought. As a result, climate models may be underestimating the frequency and severity of heat waves in the future. According to the study, Europe has seen an increase in summer warming of 1.3C between 1986 and 2015. In this period there has also been an increase in severe heat waves, most notably in 2003, 2010 and 2015. The 2003 event was linked to the extra deaths of thousands of elderly people due to heat stroke, dehydration and increased air pollution. In 2014, researchers from the Intergovernmental Panel on Climate Change found that the period between 1983 and 2012 was likely the warmest 30 years of the last 1,400 in the Northern Hemisphere. But this new, large-scale study, involving 45 researchers from 13 different countries, attempts to put the European temperatures experienced in the past three decades into an even broader context. They have understood for many years that the last 1,000 years was cooler because of the Little Ice Age, which lasted from the 14th to the 19th Century. They wanted to go as far beyond that as they could to better understand natural variability. To do this, the researchers used recently developed statistical reconstruction methods, as well as a number of what they term "high quality proxy records", to estimate the European mean temperature variation since 138 BC. "We've got 2,000 years of reconstruction where we have values for every year and the big surprise was that there wasn't a single 30-year period that was as warm as the last 30 years; that was unexpected," said Prof Danny McCarroll from Swansea University, UK, who was part of the research group. The researchers then used modern climate models to predict past temperatures and compared the results with their newly reconstructed record. "The modern models don't reconstruct the full range of climate change in the past, so they are underestimating the natural variability of the climate," said Prof McCarroll. "When they predict forwards, they predict the effect of CO2 but they have to sit natural variability on top of it. If they underestimate that they underestimate the extremes - so the recurrence of heat waves are likely to be underestimated by these models." Even though the new reconstruction has a wider range of natural variability in summer temperatures than previous attempts, the temperature data recorded in the past 30 years still sits outside it, pointing towards the same inference as made by the IPCC - that the recent warming is mainly caused by humans. "The last 30 years lie beyond the bounds of natural variability," said Prof McCarroll. "Climate modellers are always reticent to say a weather event is because of anthropogenic effects - but if you see those 30 years in the context of 2,000 years, and it's so unusual, it really suggests it is because of the greenhouse effect." The team found that the first century was the warmest in their analysis, slightly hotter than the 20th Century but according to team, the difference between the two was not statistically significant. There were plenty of warm summers during Roman times, but conditions in Europe cooled between the 4th and 7th Centuries. The medieval era was generally warm. The research has been published in the journal of Environmental Research Letters.